Last fall, I was more than a little obsessed with knitting a large and stripey garter stitch hat in stone, red, and teal. This in spite of the fact that I have absolutely no other accessories to go with these colours and am a little particular about being matchy. 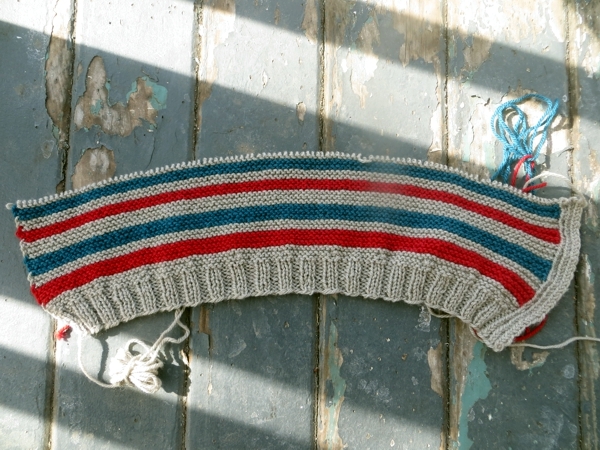 Adding to the lack of logic, you may recall that it all ended in tears when I realized at the top of the crown that I ought to have done a gauge swatch before I started. Honestly, design a few hats for other people and the next thing you know you're thinking you can take shortcuts for yourself. It is, in a word, HUGE. Not to mention completely out of proportion in length versus width. 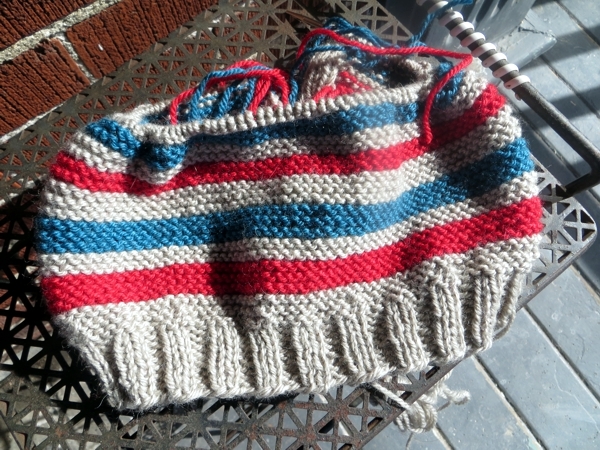 All that is the recap though, because the other day I put some time into phase two of the stripey hat. YAY. I still haven't got it out of my system, and as other schedule projects got cleared off my desk I snuck back and dug the unused yarn and needles out to start a much smaller version. 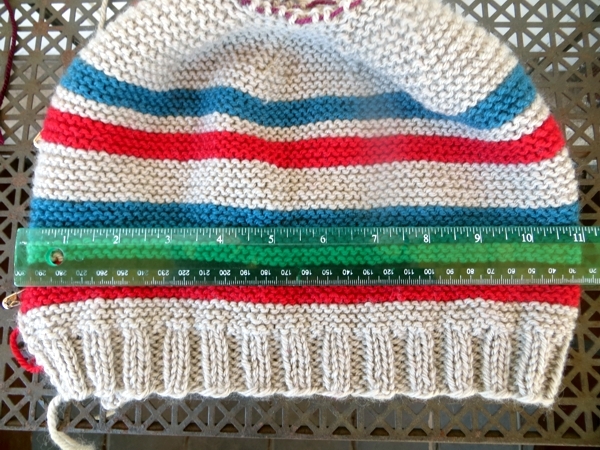 Not before measuring for gauge though, and writing up the pattern as I discerned it from the existing hat. I have so much learned my lesson. Obviously it would have been much easier to write it up from the notes I took as I was designing the original, right down to the clever trick I came up with for changing colours securely, but those notes were lost in the shuffle when we had to move everything out of my working room after the basement flooded. I'm sure they still exist, somewhere, but the memory of the clever trick is gone and I can only hope either to recreate it or find the slip of paper I was writing on lo these many months ago. Still: the original hat was enough to go on, and anyway I did some finetuning this time, not least to deal with the size issue. Even though I still don't have anything to go with it except perhaps the excuse to knit handwarmers to slip over a pair of black gloves, I am as smitten as ever. That's partly because of the colours, and partly because this Debbie Bliss Blue Faced Leicester yarn is so fabulous, and partly because garter stitch is so squashy. ... until you measure it, and discover it's still not producing the right proportions. Le sigh. I had to act quickly because much as I love the process and being finished things, I know I will not wear a hat that matches nothing and doesn't have the style I was aiming for. 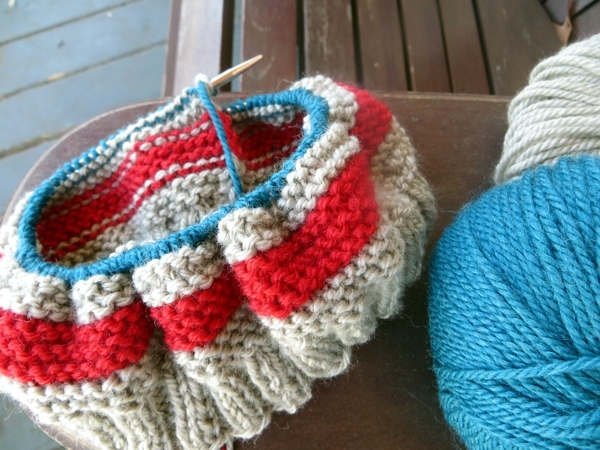 Yep: off the needles. I couldn't bear to photograph the frogging. If I can get this right some day, it's going to be beautiful, don't you think? Here's hoping third time's the charm! 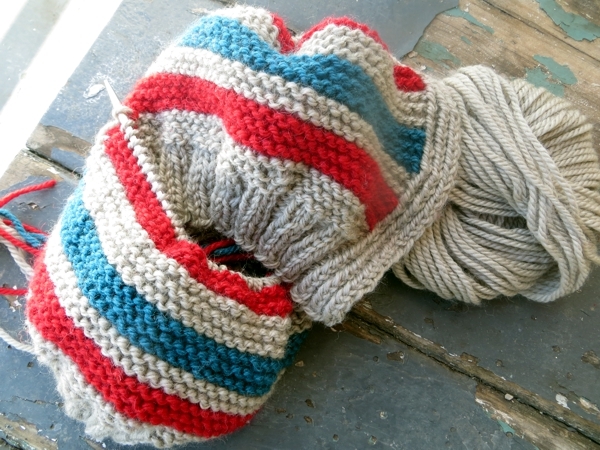 May all your knitting go right the first time, at least until I see you on Monday. it IS very pretty! Good luck figuring it all out!